From a Tuscan sun to an Aussie one. 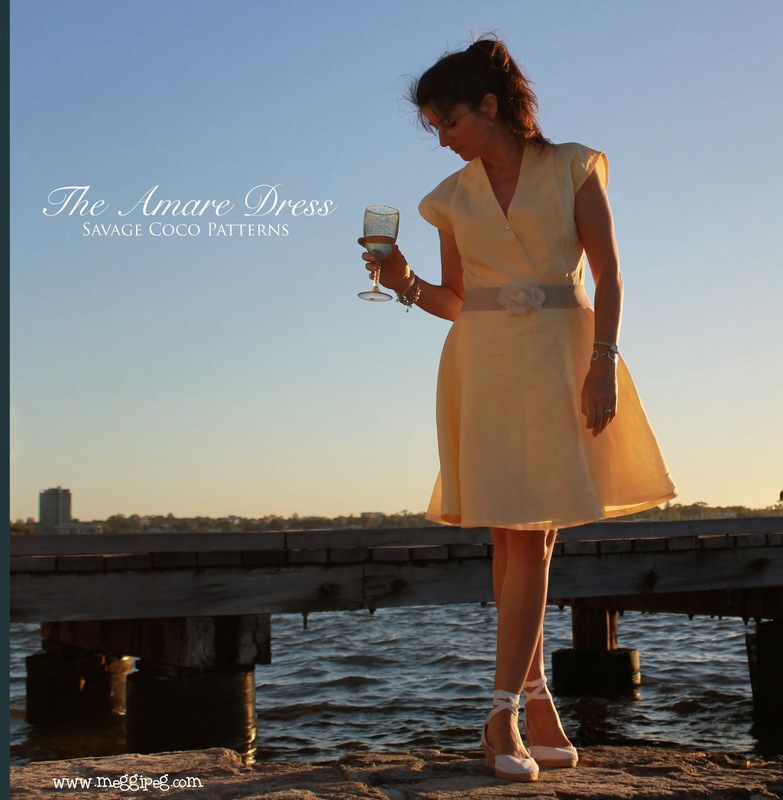 The Amare dress pattern by Savage Coco is based on a dress worn by Diane Lane in 'Under a Tuscan Sun'. I feel effortlessly glam in this breezy dress. 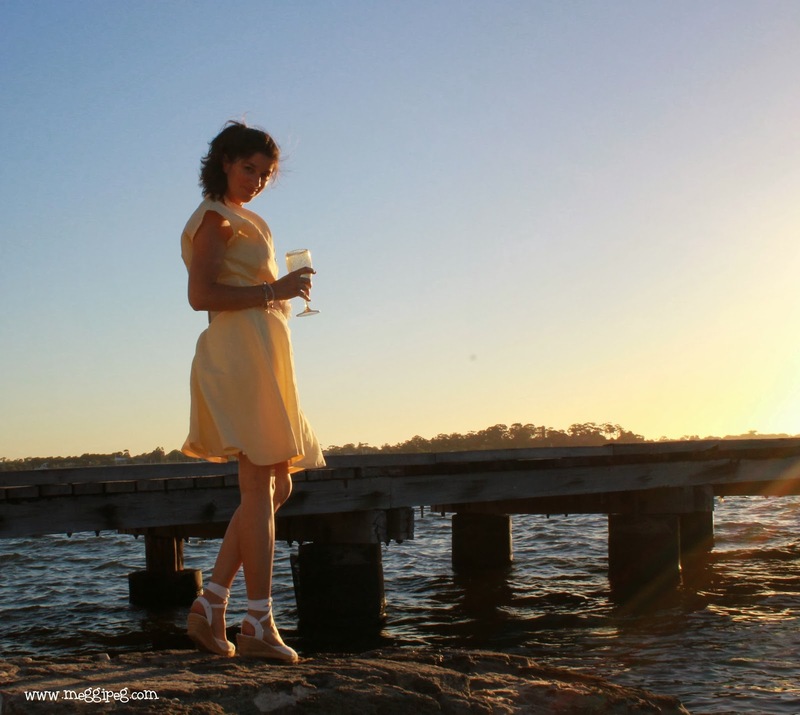 It is perfect for a soiree by the beach with plenty of cold white wine to keep cool on a warm evening! There is a full tutorial on Coco's website for making this dress with lots of clear pictures and tips. I always learn something when I make one of her patterns and I love how the details in the tutorials make the dresses come together with a lovely finish inside and out. This dress is probably suitable for an intermediate sewer. It is currently available in size medium, which gave me a perfect fit (I am approximately AU/UK size 10-12, Burdastyle size 38), as a downloadable PDF for US$4.99. I chose a buttery yellow linen for the dress, which I had bought in Bali some time ago. The quality of the fabric is really lovely and perfect for this dress, although a drapier fabric is actually recommended. The front cross-over panels were cut on the bias and folded double which, along with some other clever construction, gave a beautifully neat finish to the inside of the dress. This double layer at the bust also helps if the fabric is a bit see-through, as mine was. I made a slip to wear under the skirt, but the top was fine as it was with a single button to keep things modest! The bodice has back darts, which give a lovely, blousy shape and the skirt flares out perfectly without adding bulk to the hips. The sleeves are incorporated into the side pieces and are very flattering and summery. I removed quite a bit from the length of the skirt (approximately 20cm) and a little bit from the cross-over pieces to open up the neckline a fraction. Otherwise I followed the pattern exactly and the fit is spot on. This is an enjoyable dress to sew. I found that the PDF print-out went together easily and the pattern pieces are drafted to fit together perfectly. I couldn't be happier with how this dress turned out. Now I just need some more invitations for glamorous summer events! I have entered this dress into the 'Cocktail Dress Competition' on Pattern Review. Voting begins on 2nd Jan so hop over and have fun choosing your favourite creation. Lovely looking dress and beautiful photography. Thank you. Mr M was rather chuffed with his photos this time! Wow, how glamorous! The dress, the photos, the inspiration! It's all beautiful - and it looks like it's in my size - double extra bonus! I have to say, I like your hem length better than the inspiration pic. Thank you for the lovely comment and yes, you should definitely make one for yourself! How pretty! I love the color of your linen, so warm and sunny. Thank you. I like this colour much more than I expected. I've never had anything this colour before! You know what I REALLY like about this dress? It's the same color as chilled Chardonnay! Oh, you do have such excellent taste! Mmmm, my favourite summer drop. I might go and pour a glass right now!